We’d love your help. Let us know what’s wrong with this preview of The Man Who Was Never Shakespeare by A.J. Pointon. To ask other readers questions about The Man Who Was Never Shakespeare, please sign up. This is as close to an irrefutable text as I've ever read concerning the authorship controversy. As the title states, Professor Pointon's brilliant and thoroughly-researched tome offers no theory as to who wrote the works of Shakespeare but rather definitively proves that William Shakspere of Stratford--the man credited with creating the canon--did not and could not have written the poems, sonnets, and plays that have influenced Western civilization for over three centuries. The book is a must-r This is as close to an irrefutable text as I've ever read concerning the authorship controversy. 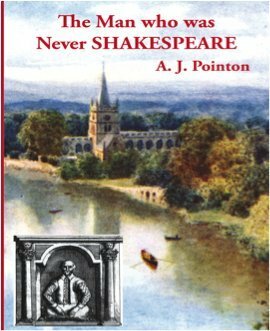 As the title states, Professor Pointon's brilliant and thoroughly-researched tome offers no theory as to who wrote the works of Shakespeare but rather definitively proves that William Shakspere of Stratford--the man credited with creating the canon--did not and could not have written the poems, sonnets, and plays that have influenced Western civilization for over three centuries.